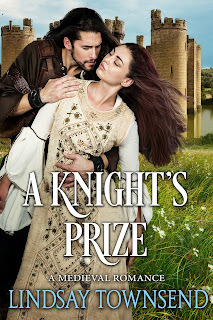 Here, as part of Sample Sunday, is a new excerpt from A Knight's Prize. In it, Edith realizes she has been out-played for the moment in the courtly game by the fearsome - and attractive - knight, Ranulf. "Those are my lord's terms," said the squire. "A kiss for each favor. The lanky young man stopped, scarlet in the face. Had Edith been less incensed she might have felt for him, but she had her own troubles. But even Walter knew she could not be unveiled. It would be too great a blow to her mystique, and dangerous if Sir Giles saw her. How can I keep my word and still be unknown? He will never agree. He will not agree and my people and I will remain safe. Edith gripped the edge of the table, feeling as if her whole world was see-sawing. "He does what?" she whispered. "He agrees to your terms, my lady," gasped the squire. He was still short of breath, having run hard up the field. "He asks that you have the cloths ready when he comes presently." He bowed out of her presence and Edith sank into her crouch, holding her head. She felt dizzy with a kind of thumping dread and a dazed anticipation. "He is coming now? What will I do? What should I do?" "Kiss him and be done," said Teodwin curtly. "Will you have Sir Tancred admitted? He is hovering outside, even now." "No!" She wanted no one to witness this. Wait - did I not say to Ranulf earlier that Sir Tancred was my chaperone? All these truths and half-truths! I cannot remember! "No, I mean, yes. Admit him, yes." Lindsay, I love this excerpt, so compelling, and there she is caught up in her necessary lies. Oh no!